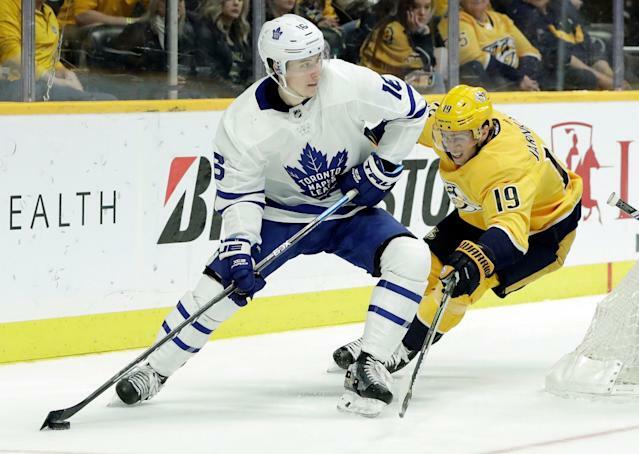 The big stat you’re hearing for the Maple Leafs a lot lately is “23 goals against in four games.” Obviously that’s horrible, and it only got worse last night as the Leafs looked awful in a 3-0 loss to Nashville. Less often stated is that if you go back to New Year’s, they’ve given up 30-plus shots 25 times in 34 games. It’s the same number of times they cleared 30 themselves. Which, okay fair enough, but this is likely a top-three team in the league in terms of the pure quality of its roster, and Mike Babcock is supposed to be some kind of genius, right? So the question isn’t “What’s wrong with the goaltending all of a sudden?” Because sometimes goalies give up a ton of goals sometimes and there’s no real rhyme or reason to it. Last year, there was a stretch where Tampa gave up 26 in six games and no one acted like the sky was falling (probably because they went 5-1 in those games, because of course they did). So that happens. The real question is why the Leafs, with all their talent and coaching, are operating on such thin margins in terms of just putting the puck on net, possessing it, drawing penalties, etc. in the first place. Some of that, I guess, you can call score effects — they’ve scored 40 more goals than their opponents and have one of the best records in the league — but a lot of their numbers are worse than the Blues’ are, and the Blues were horrible for the first two months of the season. However, these guys play in the conference with the best and, arguably, second-best teams in the league this season. Boston’s their first-round draw and if the Bruins are fully healthy (big “if”) it’s a huge mountain to climb against a team the Leafs have shown time and again are tough to beat. And if they somehow win that first-round matchup (feasible), well, the Tampa Bay buzzsaw likely waits in the second round. And also maybe this is all quibbling a bit, since even with all the concerns you can rattle off for the club lately, they’re still sitting sixth in the league. But the problem for just about everyone seems to be that they should be better than that. You don’t put together a club with Matthews, Marner, Tavares, Rielly, Andersen, Nylander, Kapanen, Kadri, Gardiner, Muzzin, Johnsson, and so on while a good chunk of those guys are on soon-to-expire ELCs and settle for underperformance. This was, in many ways, supposed to be the go-for-it year. Sure, you can say Lou Lamoriello’s stewardship of the team led to some unfortunate contracts that are now weighing them down the cap, but there’s more to it than that, and it seems to me that a lot of it is coaching. You can only get players to play to their talent at some point, but you also have to put them in a position to do so. This isn’t really a big surprise for-instance here, but the fact that Ron Hainsey is out there in a shutdown role a lot of the time is baffling. Every coach has his favorites and often over-relies those guys, but this guy wasn’t a shutdown defenseman at any point in his life, let alone when he turned 37 in a league that’s speed speed speed for 60 minutes. I don’t think Hainsey has been as bad as some people would likely suggest; he still has a positive impact in certain situations. But he shouldn’t be getting the kind of minutes or situational use he does. Not even close. It’s not just Hainsey, of course. It’s the fact that Marleau, despite his age, is playing every single night and he really shouldn’t. Even if you think he’s a valuable player for you (and probably he isn’t, but that’s beside the point), he’s 39 and can’t keep up even when he’s fully rested. Ideally you treat him like baseball teams treat their catchers or basketball teams treat older stars. Give him a day off three out of every four, or four of every five. Definitely in back-to-backs. He certainly shouldn’t also have gotten as much time with Matthews as he has this season, because he’s a drag on production. And I know he’s a Proud Guy and Respected Veteran who’s Great In The Room but he’s also Not Moving The Needle Anymore and that has to get more consideration. Speaking of being on Matthews’ line, you didn’t need to be a brain genius to figure out that, oh yeah, he and Nylander would probably produce together with Andreas Johnsson. Nylander started slow after sitting out a couple months, sure, but Babcock also didn’t put the winger in a position to succeed after he didn’t immediately put up two points a night with Matthews upon his season debut. His most common linemates at 5-on-5 this year? Nazem Kadri and Connor Brown. Not exactly putting the guy in a position to score, y’know? And since that’s what he’s paid a bunch of money to do, the fact that you would use that as an argument against a promotion is…. odd. Babcock doesn’t seem like the kind of guy to suddenly start getting out of his own way on this kind of thing, and that probably doesn’t solve every single problem the team has even if he does it tomorrow. But the thing is, you have to maximize your ability to get as much as possible out of your group, and the coach hasn’t done it, plain and simple. But again, maybe it doesn’t ultimately matter, because look who they’re playing in the postseason.